None of us are given everything we need to be successful from the outset. We are only given the sails to guide our ships. Even those born with the proverbial silver spoon, will need to adjust their sails to get where they want to go. It is how we use those sails that determine whether or not we find success. 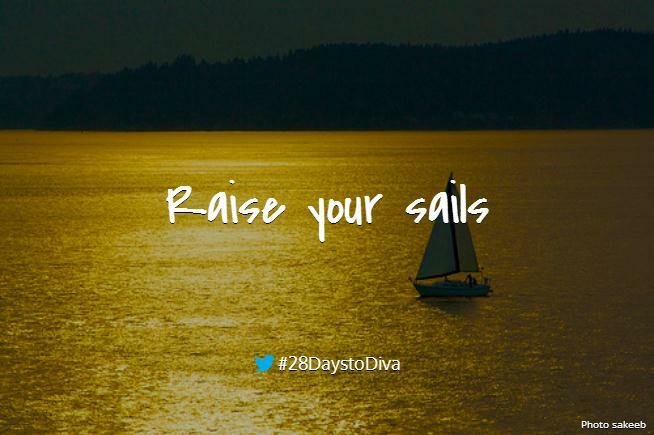 28 Days to Diva is designed to be a starting point for navigating your course. The series is a mini tutorial on how to rig the sails, but where you want to go is up to you. The creative spark that dreams up projects and collaborations is yours alone. We cannot create that spark in these posts. We can, however, learn to sail our ships. As a diva, you’ll have many projects running simultaneously. To keep your sanity intact it helps to create a timeline for each project and divvy-up the steps across your calendar. Recall how our big 10-year goals are broken down into smaller actions per day. It is the same with your project timeline. Your project timeline is not relegated to only creative projects. Your project timeline could be completing your business plan. Another project timeline could be building a private studio. If you have any wedding planning traumatic stress, you may want to prepare yourself. Remember, these are all just suggestions so that you can get the most career traction out of each performance. Settle your programming ideas on music, theme, collaborators, etc. Write out your creative experience design plan. Approach venues and determine date/place/time. Set-up a rehearsal schedule for your personal practice as well as with other collaborators. Schedule rehearsal space if needed. Create an event specific page on the website. Add all details such as program, venue, time, date, ticket price, directions, hashtag, etc. Set-up a registration or ticket store, if needed. Identify and create invitation list. Review tech needs for the recital and be ready to communicate with the venue. Send a “save the date” email to core audience members – you can include this in your regular email blast or send a special invitation. Create an informational video(s) about the program. Start updating social media with scheduled posts. Send tech riders to the venue, if necessary. Create social updates that you, collaborators, and mavens can share with their networks. Start a countdown with strategic goals and rewards along the way. Track email conversion and create new email blasts to encourage last-minute deciders. Select any catering or hospitality you may need if you’re having a post-concert reception. Send pitch letters and press releases to targeted media outlets. Make arrangements for audio and video recording with the venue or provide your own. Send all program info/program notes to the venue or print your own program. Check and double-check and triple-check that all of your tech works as planned. Plan your travel and call times. Write out and practice any “speaking from the stage” you want to include. Have someone that’s willing to be a social media guru to take pictures and post them in real-time. Plus, tweet random selections of guests’ favorite words with hashtag. Have your team member promote guests check-ins on Facebook and Foursquare. Deliver your curtain speech or “speaking from the stage” with ease. Perform like the diva you are. Send a survey to guests to learn more for your psychographic profiles. Produce a short video summarizing the experience and thanking guests. Remind guests of your other upcoming events. This may seem like a lot to think about. Most of you are already doing these tasks without realizing. Or worse, you’re doing them without an overall plan of attack. When you start systematically approaching the tasks in your project timeline, your work will become more efficient and hopefully more productive. I wholeheartedly believe that we make our own opportunities. In fact, we make our own opportunities when we adjust our sails to use the wind to our advantage rather than fighting against it. Is there anything that you think is missing from the list? What are some project timeline must-haves that you always include? I want to know. Please share them with me in the comments below. Or, as always, tweet me at @mezzoihnen.